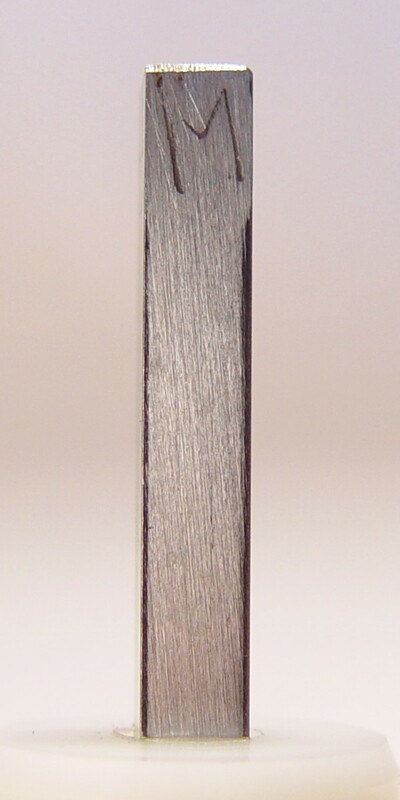 The last tests were done on mild steel and polished spring steel; this time I decided to try 4140 alloy, commonly used for lock castings. 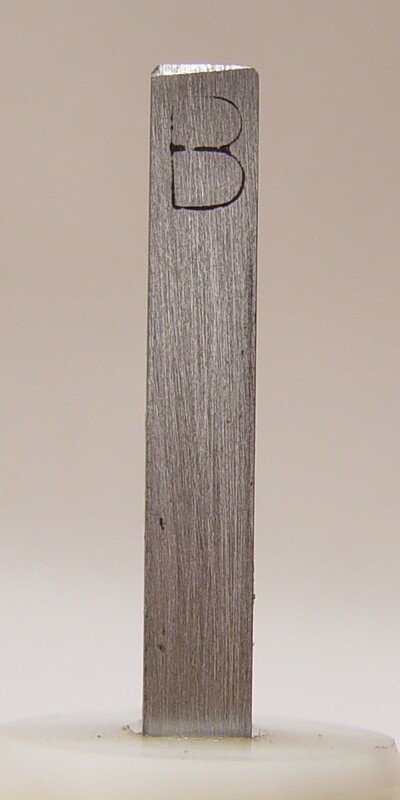 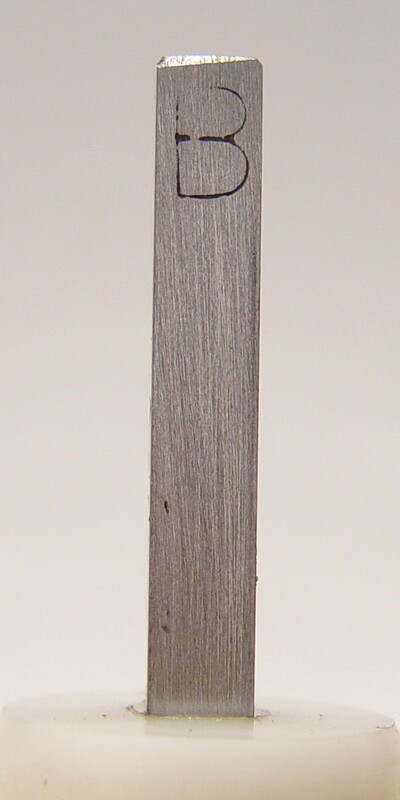 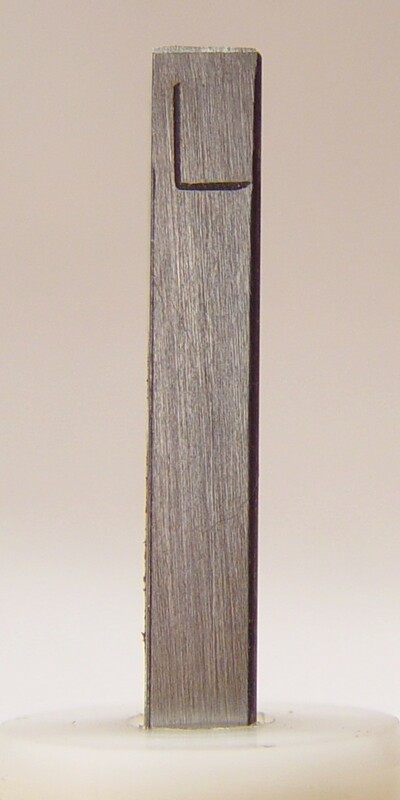 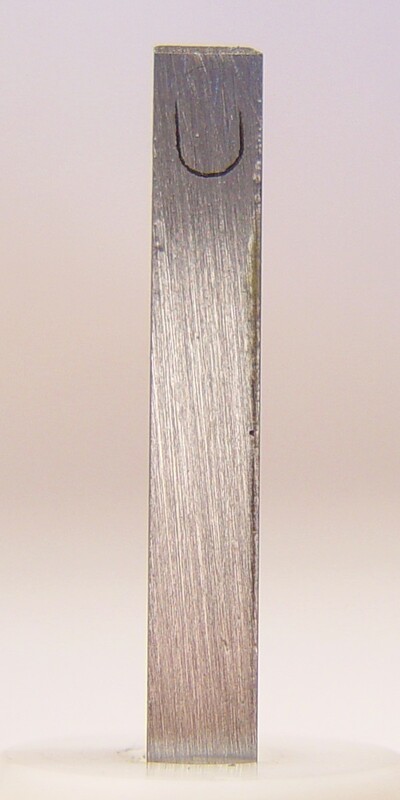 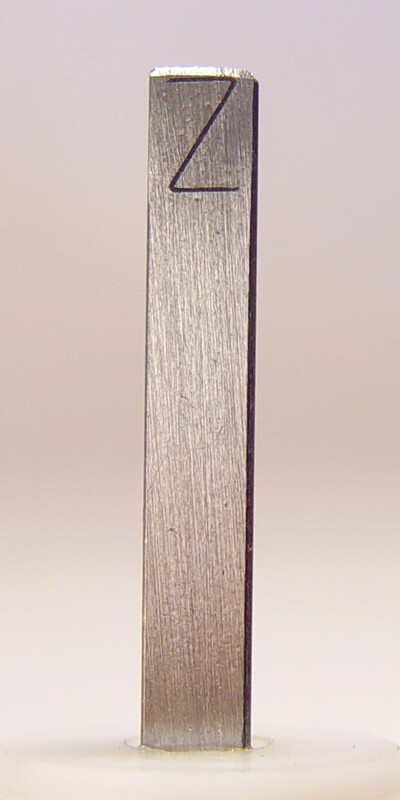 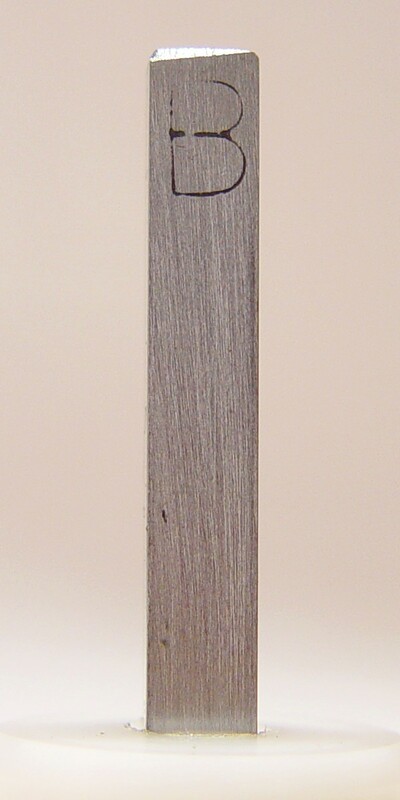 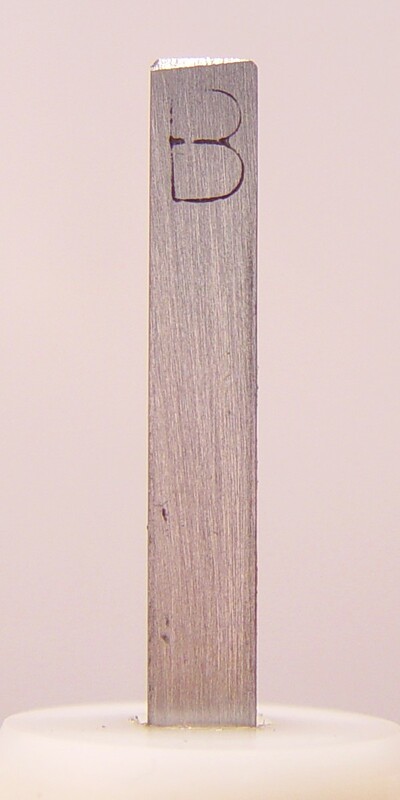 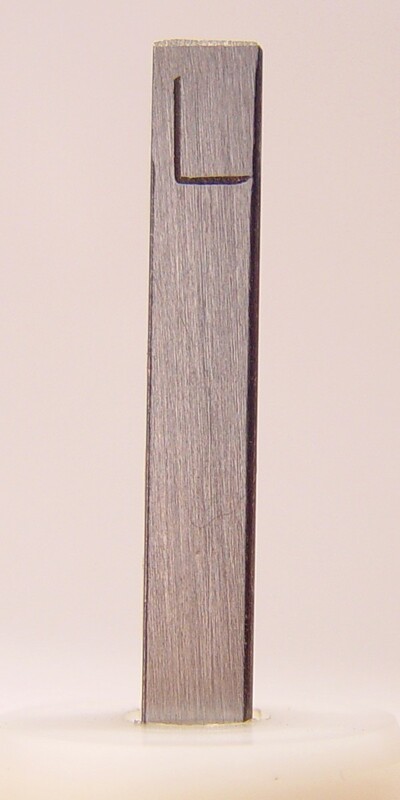 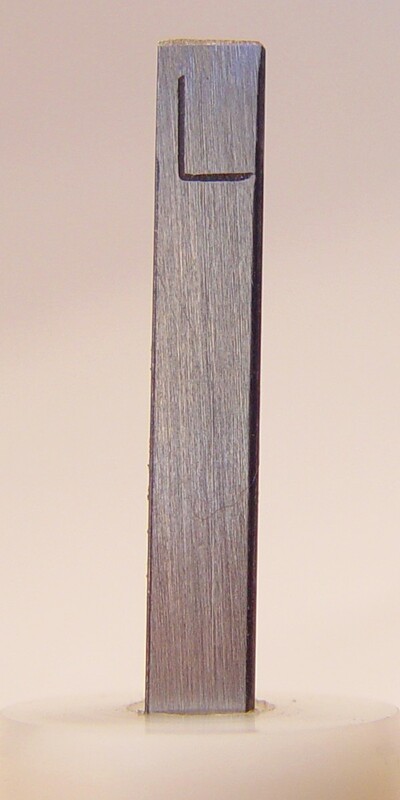 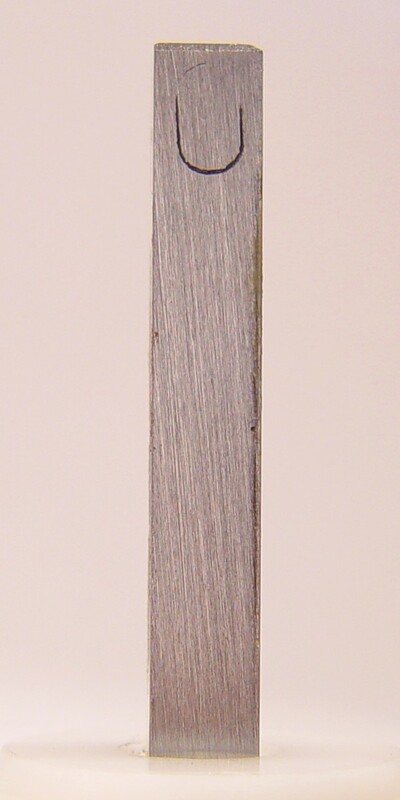 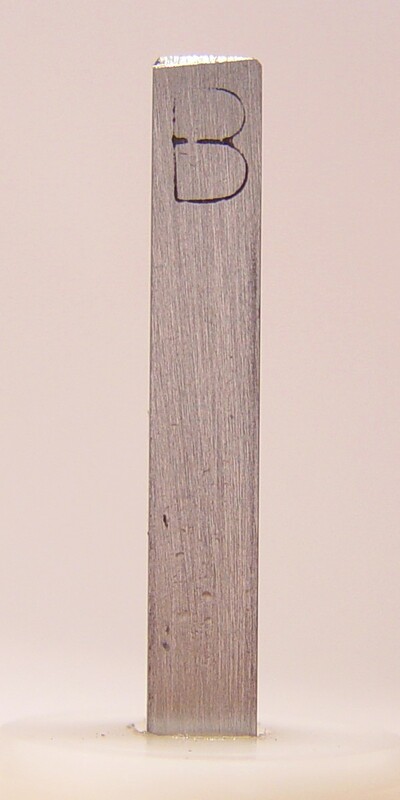 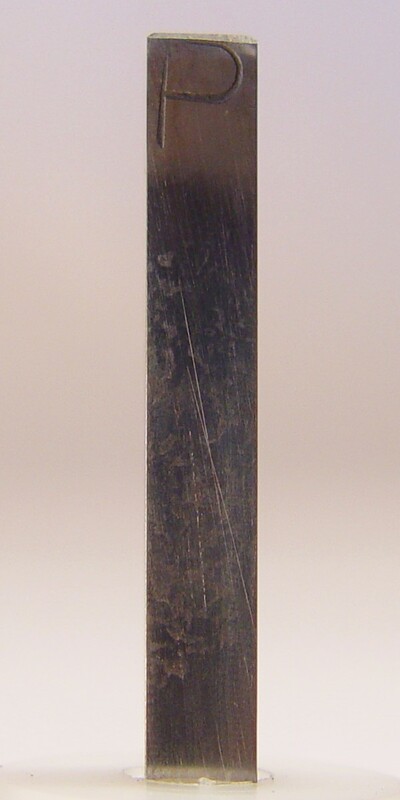 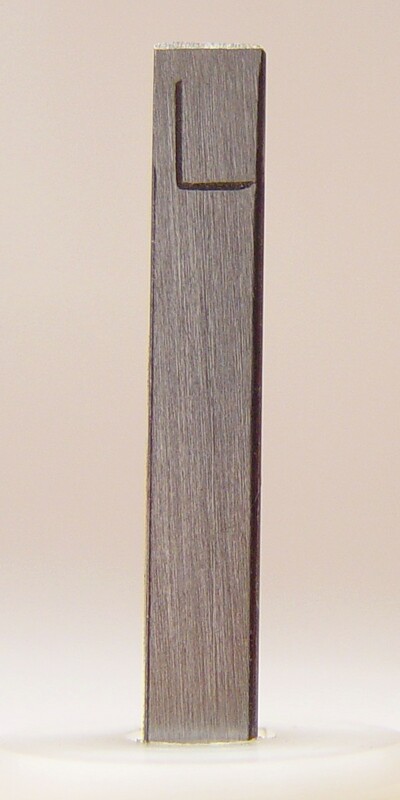 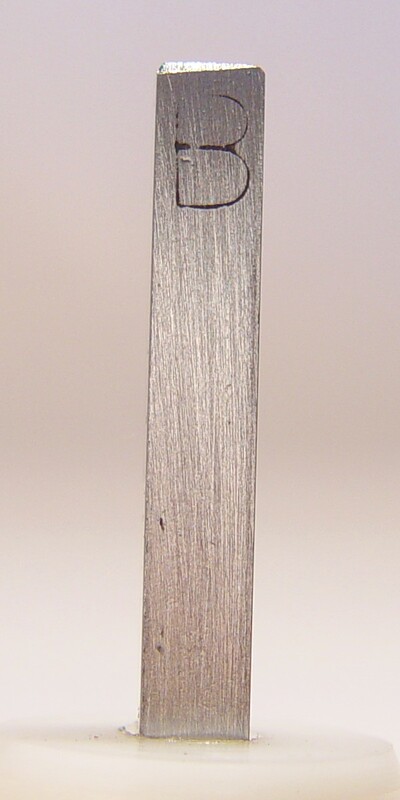 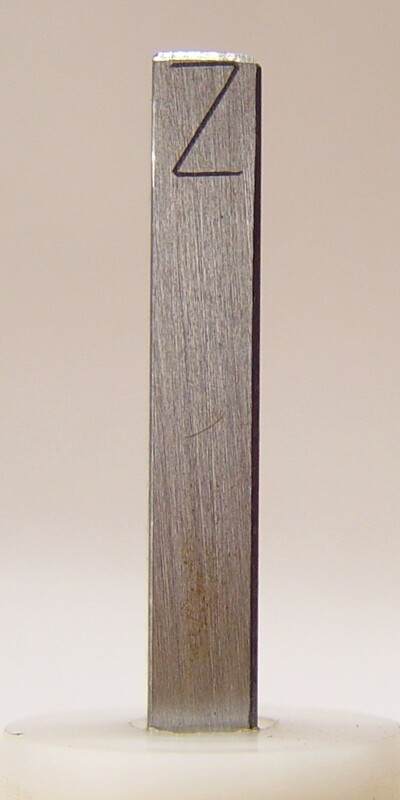 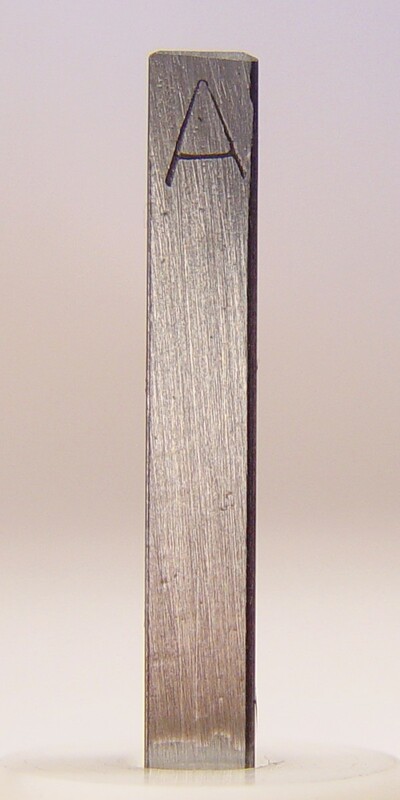 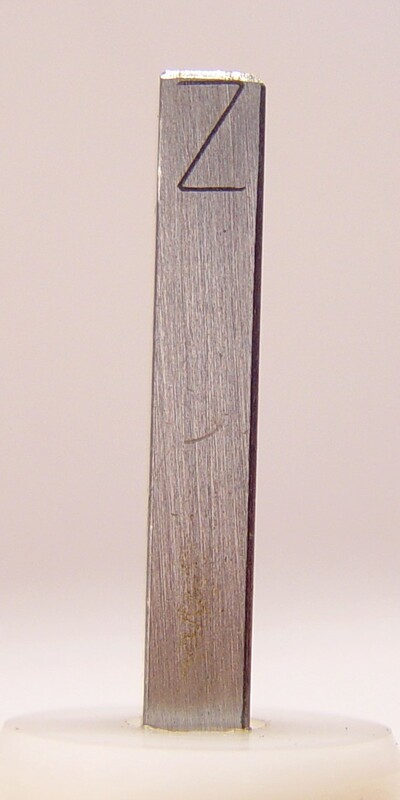 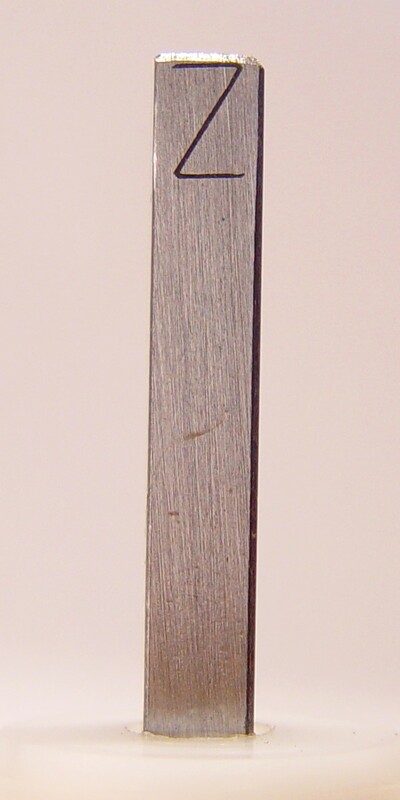 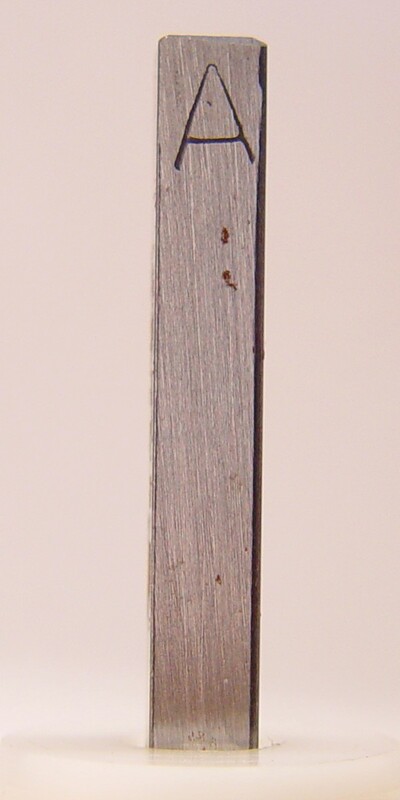 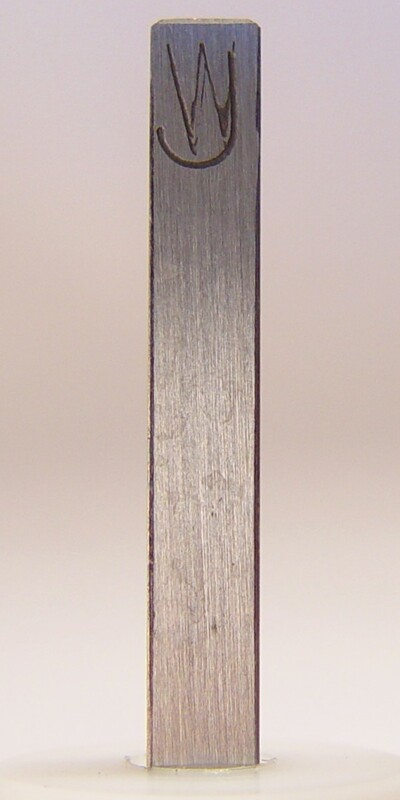 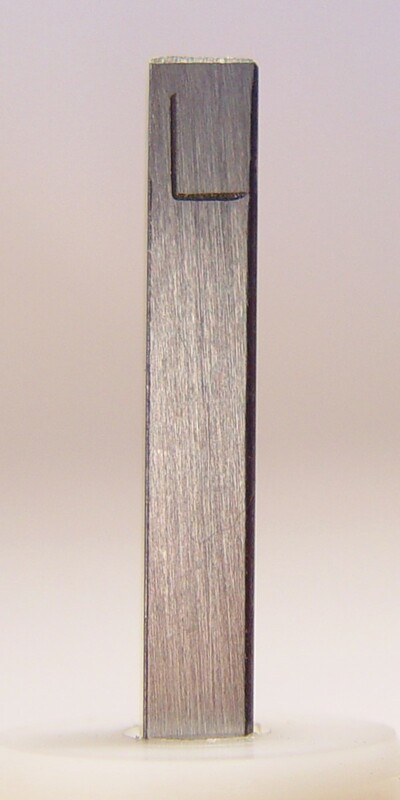 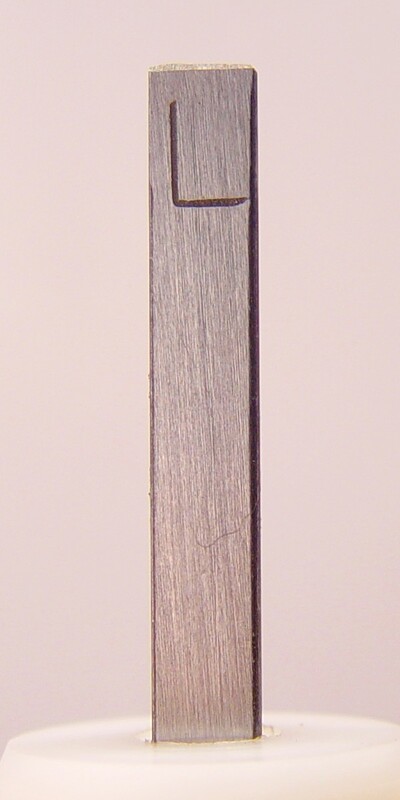 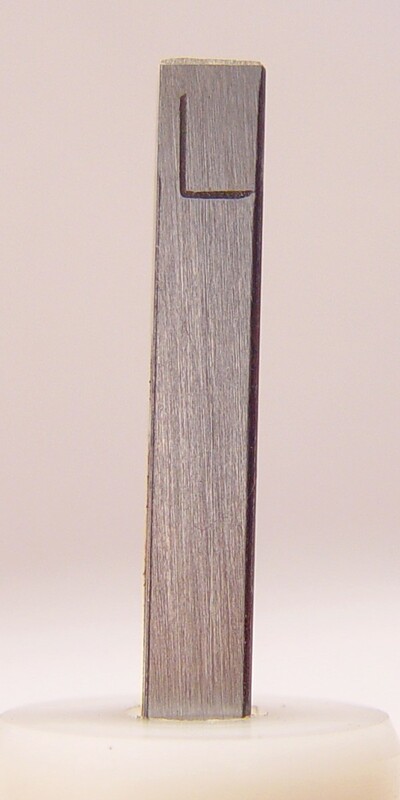 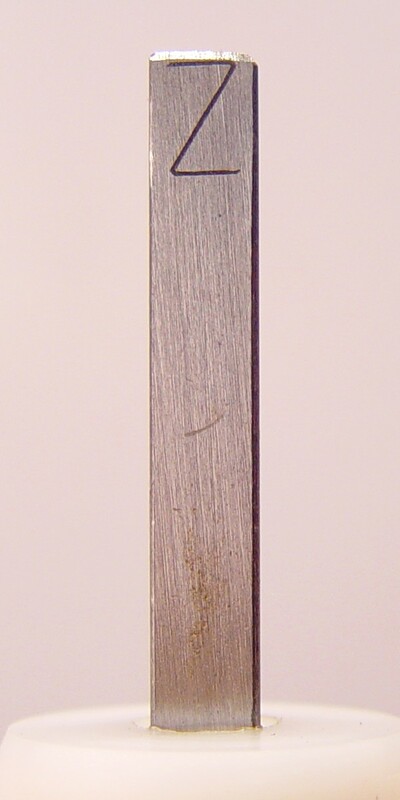 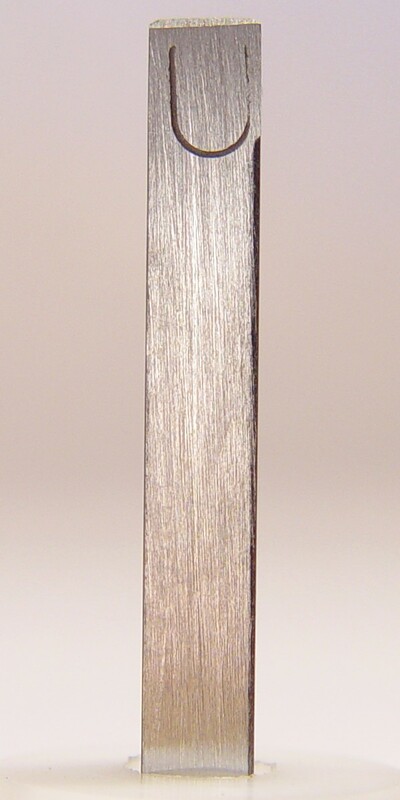 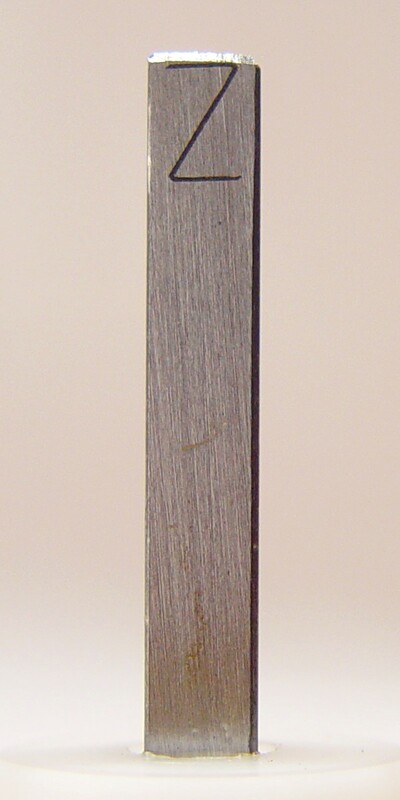 An annealed square 4140 1/4" bar was chopped into 2" sections, and after marking them for identification, each surface was water-ground with a 320 grit diamond hone. 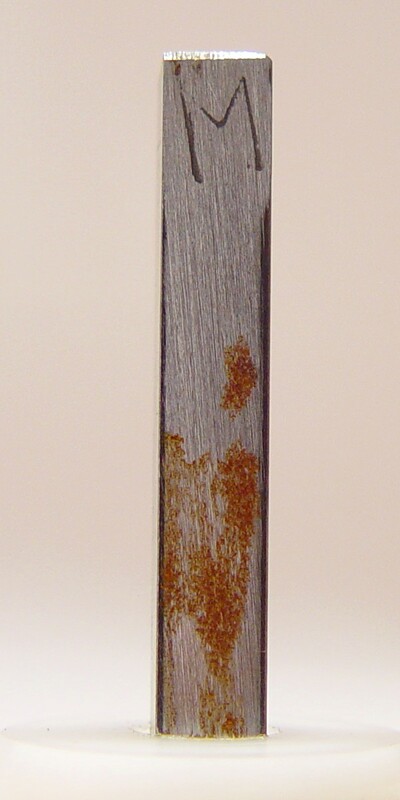 A characteristic of diamond-honed steel is that it will rust almost instantly if left exposed, so it made an ideal surface on which to test the lubes. 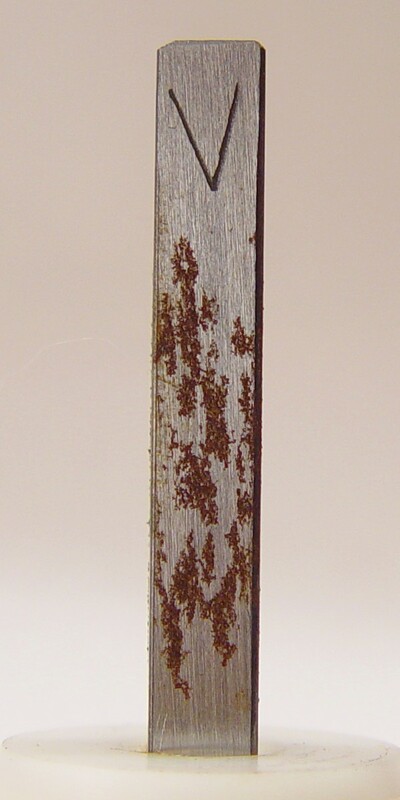 After honing and drying, each of the twelve surfaces received a different treatment. The first surfaces to be treated were those getting the solid wax coatings, which were warmed until the wax freely melted. 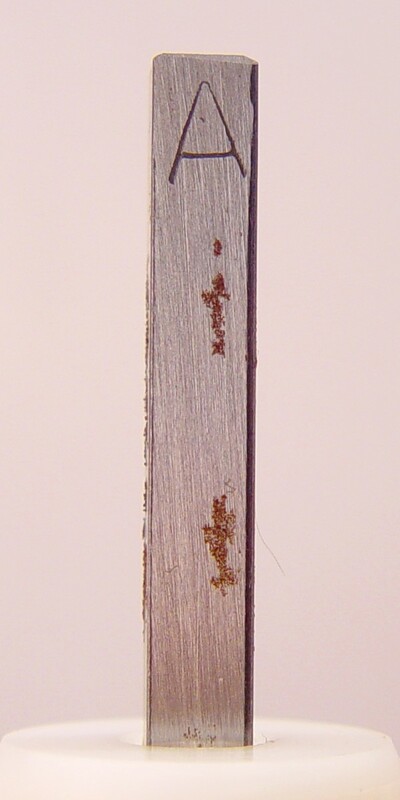 A thin layer was wiped on, and then wiped again as it cooled. 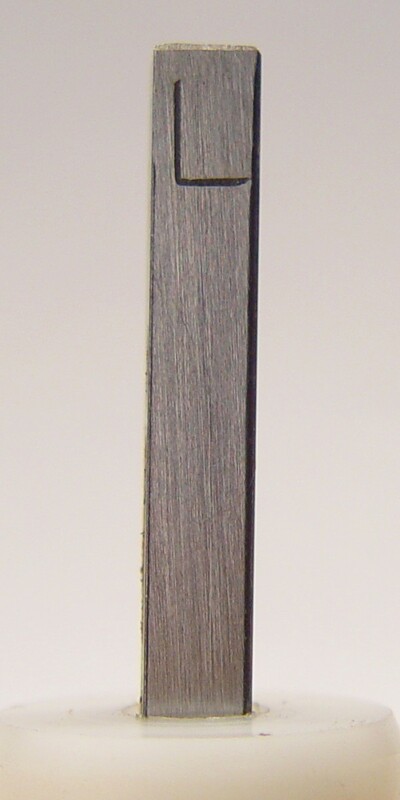 The polished surfice was water-lapped with 400 grit emery then polished with a rotary 600 grit rubberized wheel. 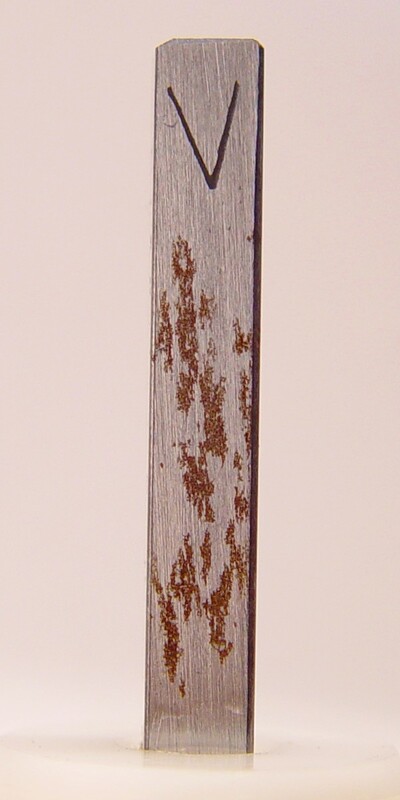 All other materials were applied as a thin coating from a moistened patch and then re-wiped after a minute. 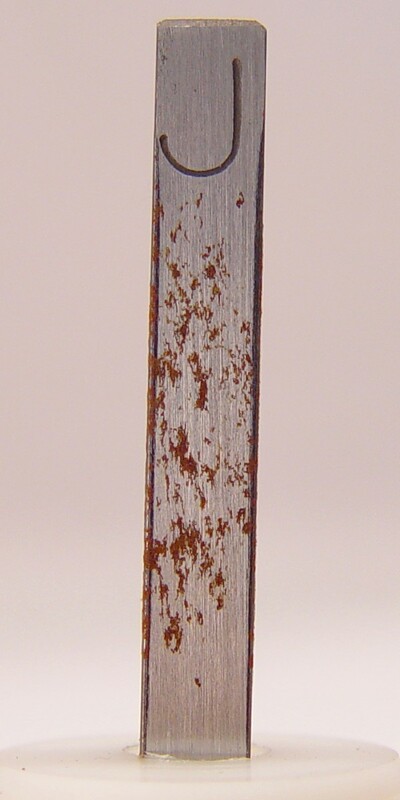 The posts were then inserted into plastic stands which allowed them to stand up in a 100% humidity box without touching any surface. 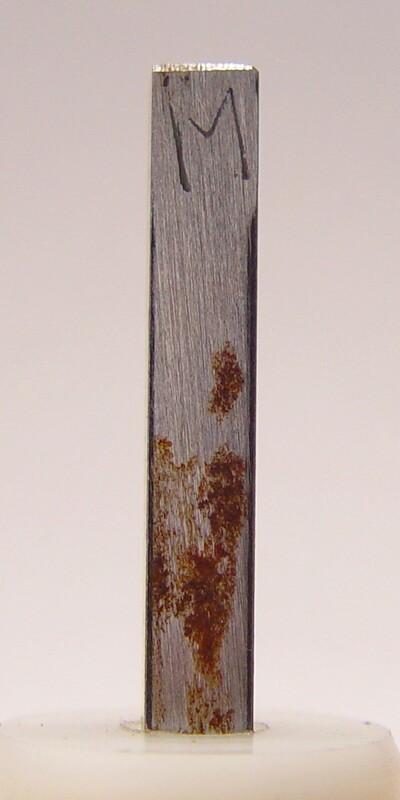 To simulate a 'dirty' fingerprint carrying corrosive material, six grains of black powder were burned in a loosely covered stainless steel pan, and the residue was dissolved in 5 ml of water. 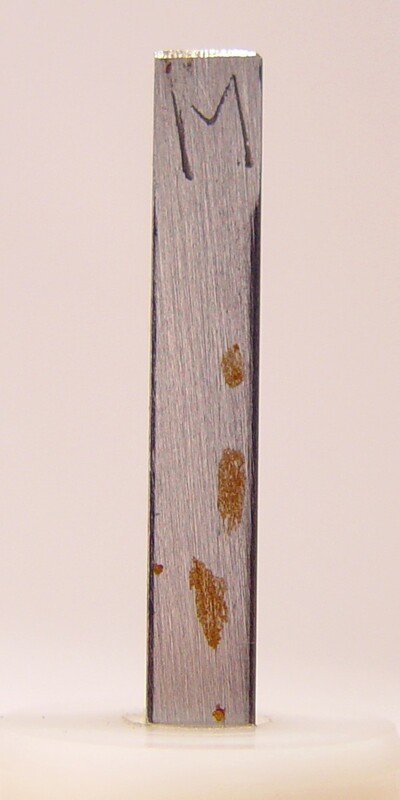 A small section of sponge was dampened with enough of this mixture so it left a thin layer of material wherever it touched. 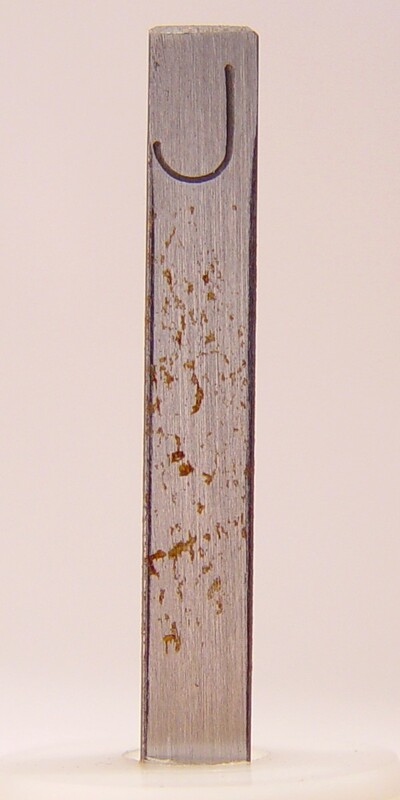 The sponge was pressed against each surface for three seconds, which left a 'fingerprint like' array of water marks. 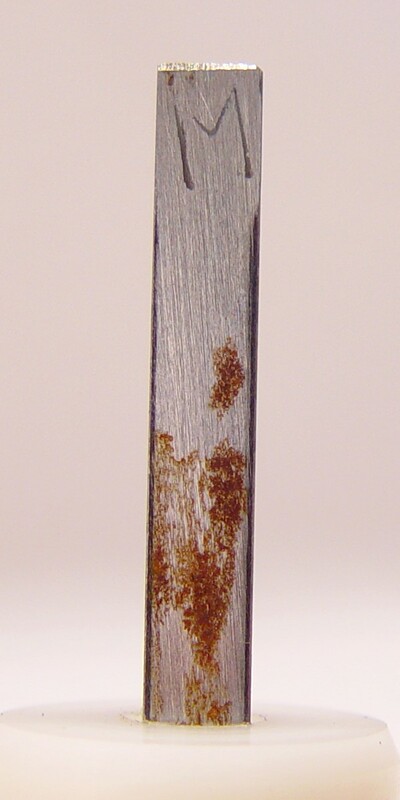 This should be a fairly severe test, since the water felt slippery, a sign of plenty of dissolved corrosive residues. All surfaces were photographed, and the humidity box was stored in a warm (80 degree) room. 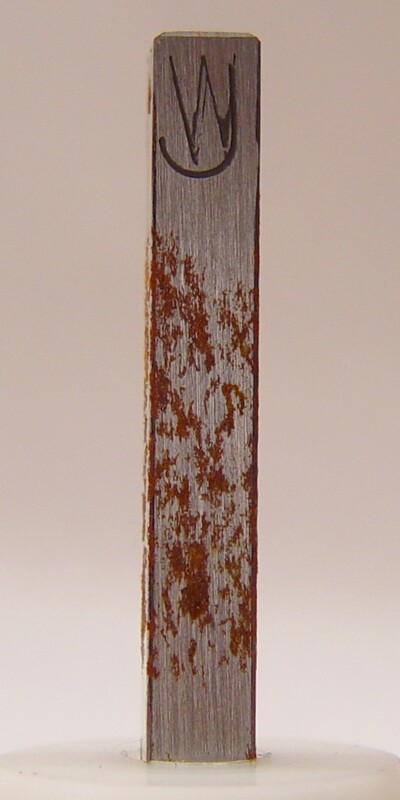 As expected, the untreated surfaces started rusting in less than a day, with the polished surface seeming slightly more susceptable than the matte surface. 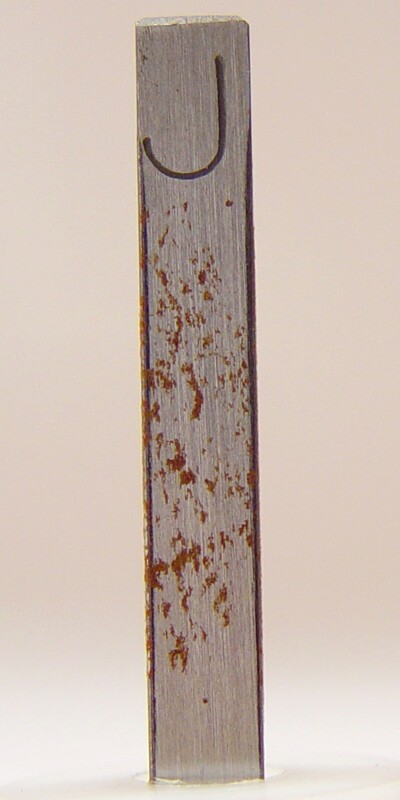 After 24 hours, most surfaces showed at least some signs of rust. 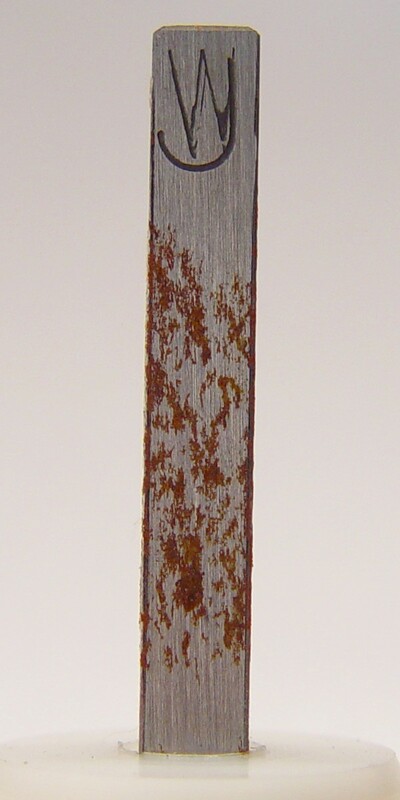 After one week, only the EEzOx, Ballistol and Lehighs were rust-free. 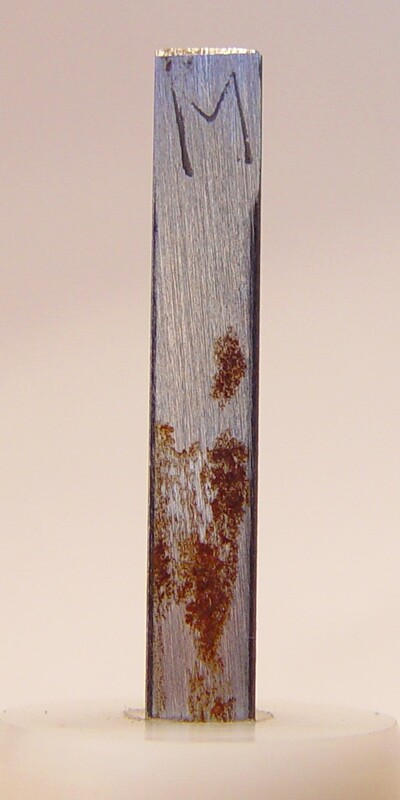 The first surprise was how poorly the waxes performed; rust spots were visible within a day and became marked after a week. 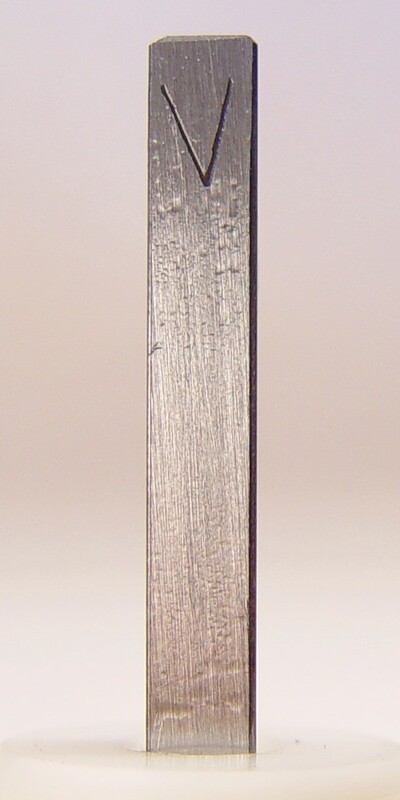 Waxes are considered to be relatively impervious, but perhaps the 'natural' waxes are not as waterproof we like to think; if you remember that wet glasses on a waxed table can leave a ring, then there must be at least some water penetration. 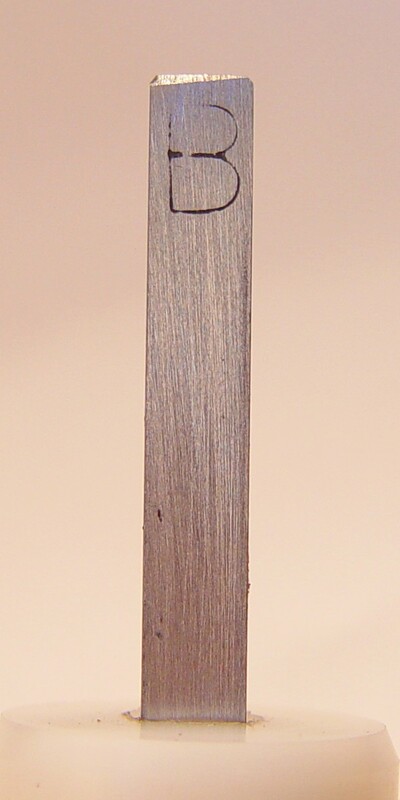 The worst performers were olive oil and Wonder Lube. 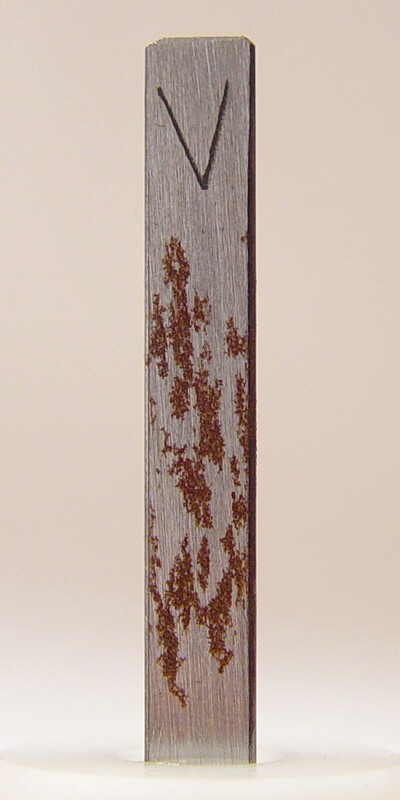 The severity and pattern was almost identical on either, with severe rusting occurring within a day. 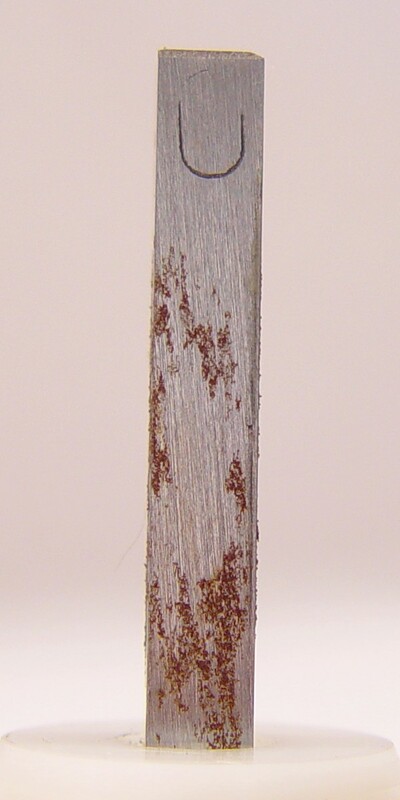 It seems like the alkaline powder residue is reacting with the olive oil to make a particularly corrosive mixture, and since Wonder Lube is supposed to have olive oil in it, this may be why they both react the same way. 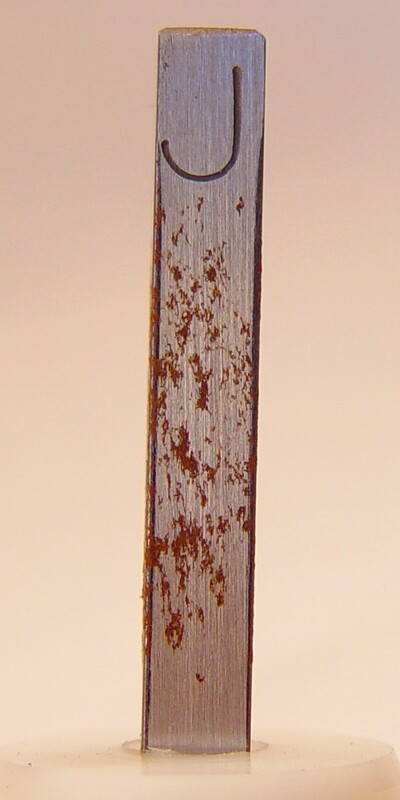 As was also seen with the first experiments, vegetable oils and materials containing them should be avoided if you are looking for corrosion-proofing; I did not test anything with animal-based oils, so I don't know if they would suffer the same fate. 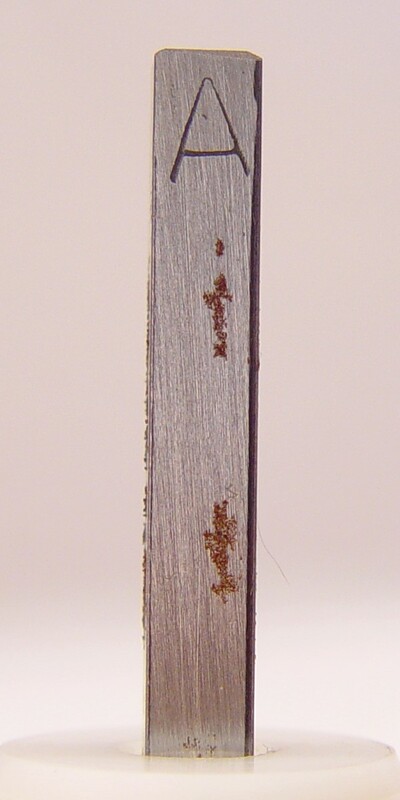 Lehigh Valley Lube is an interesting exception here; it is similar to a soap, being made from saponified tall oil (oil residue from paper processing of pine wood), but it performs better than MOS, which is similar. 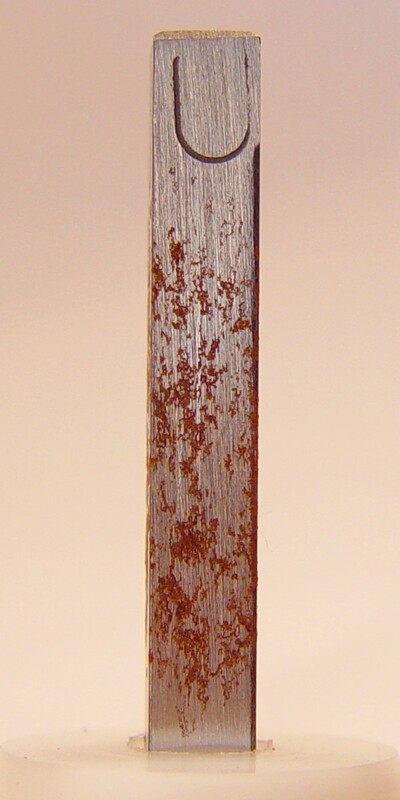 The Lehigh Valley patent states the resins from the tall oil form a protective coating independant of the soap. 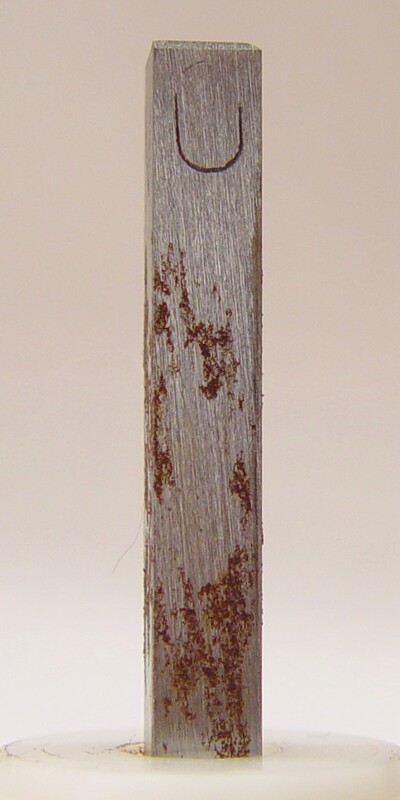 I have heard that the Lehigh Valley formulation made by Ox-Yoke did not perform well, but the product is now back in the hands of its original inventor and is back to the original formula. 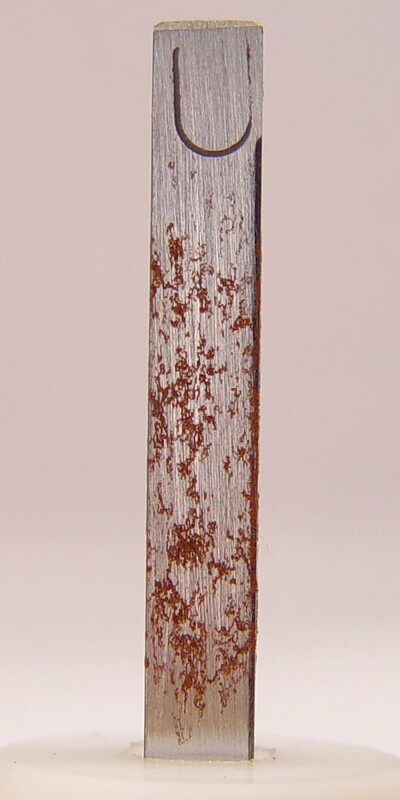 Paracelsus: "The dose makes the poison"
First, it should be understood this is a very severe test. 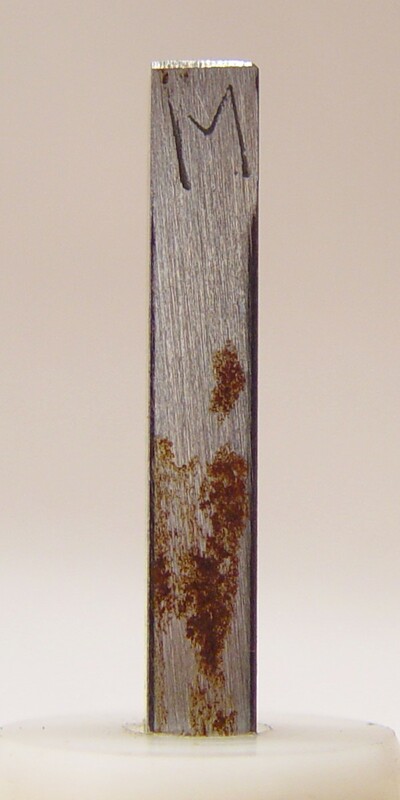 Black powder residue contains a number of potassium salts which, when combined with water, form an extremely alkaline and corrosive mixture. 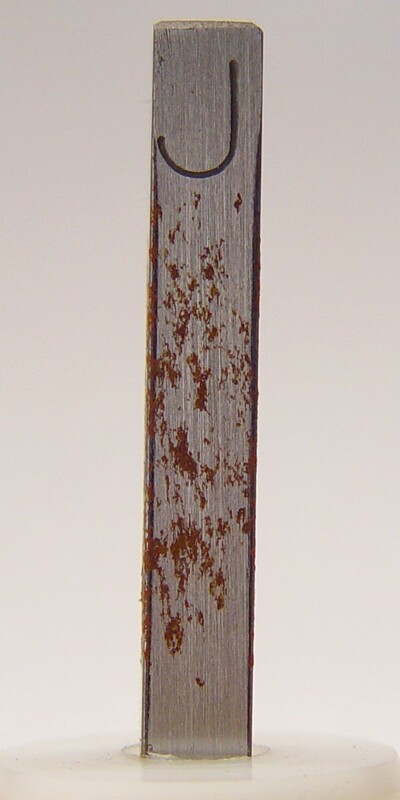 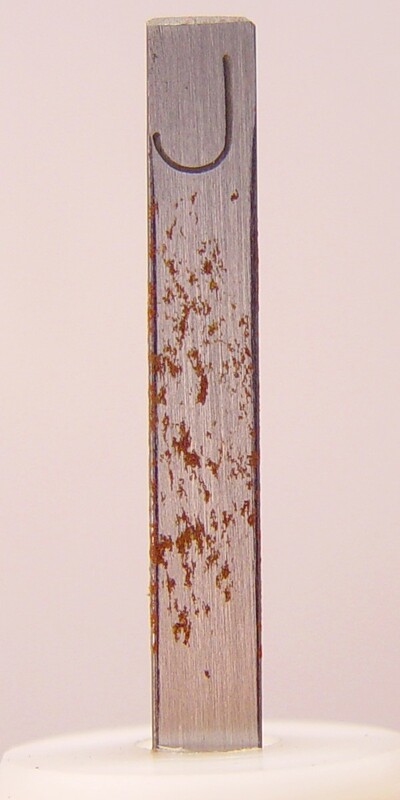 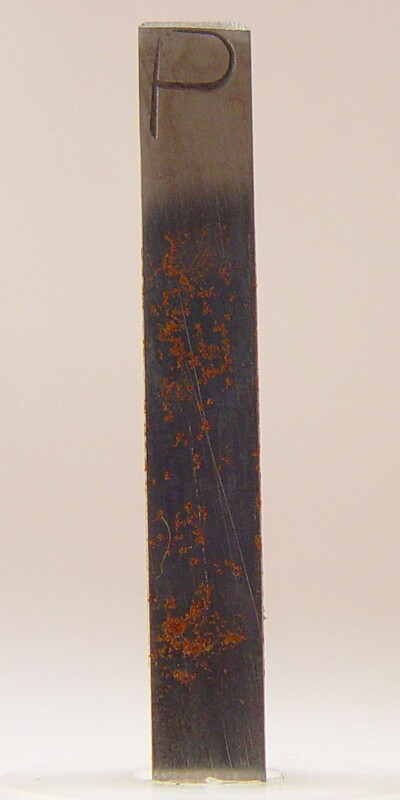 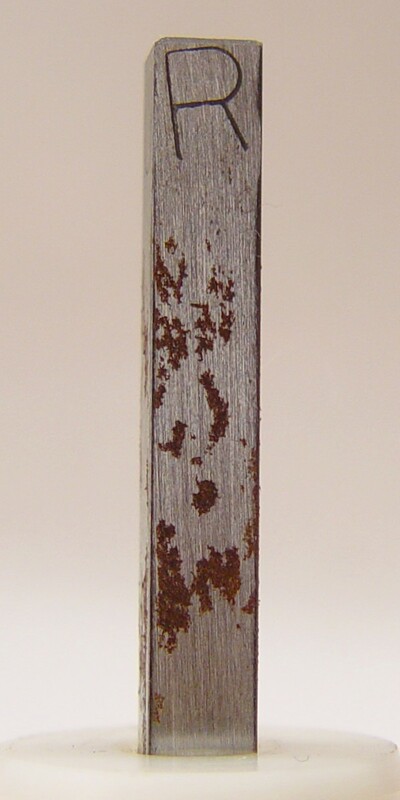 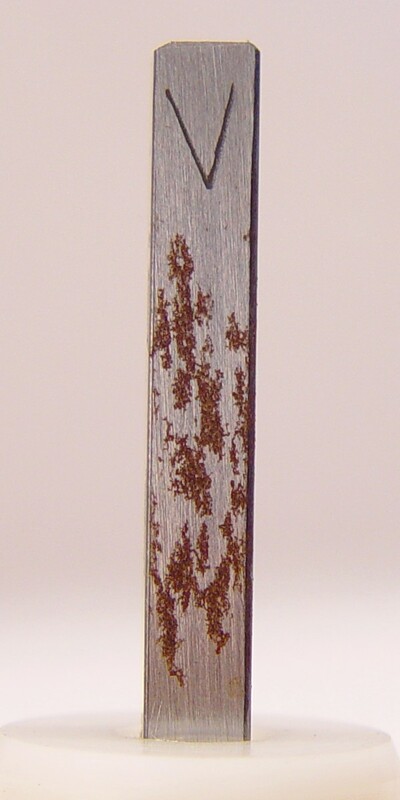 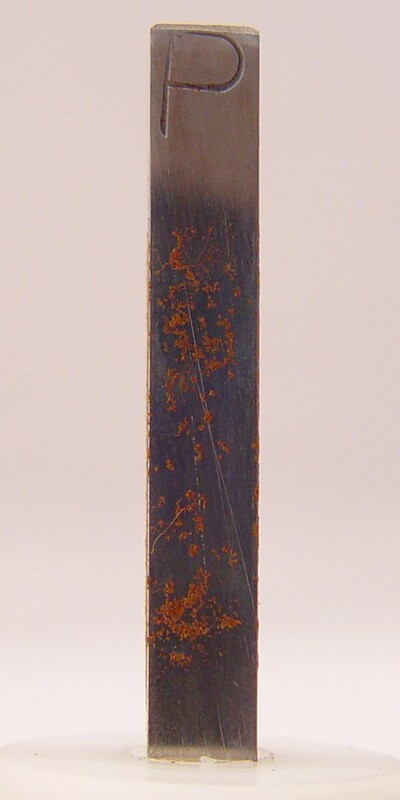 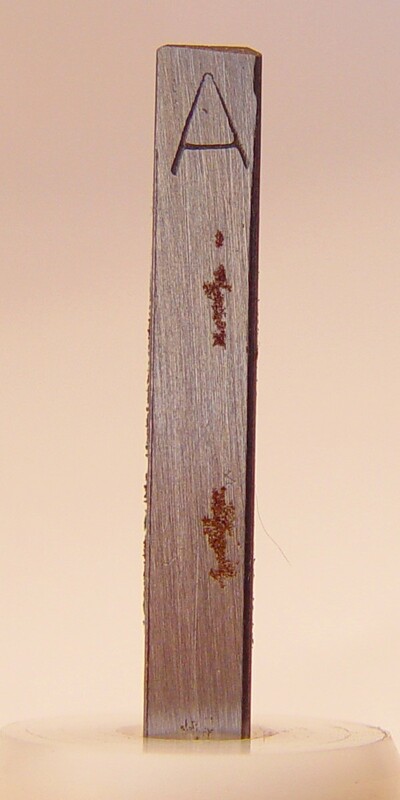 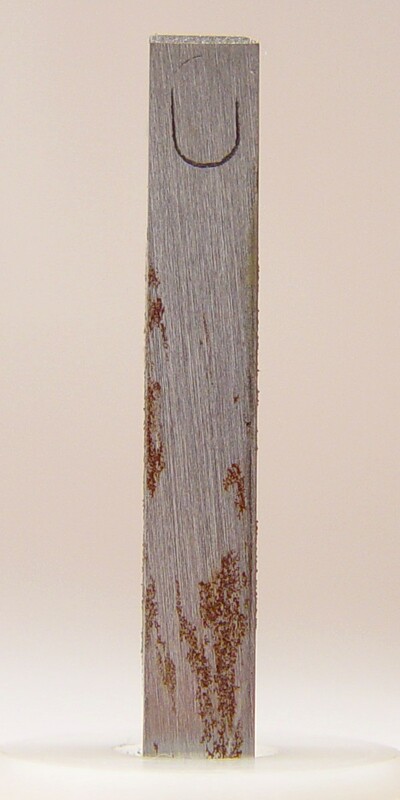 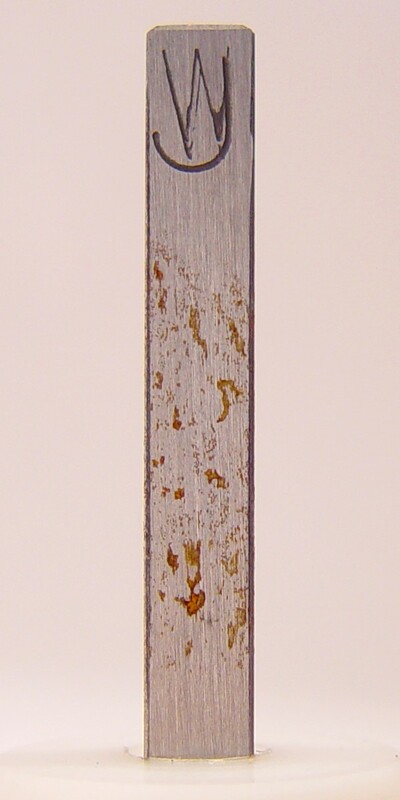 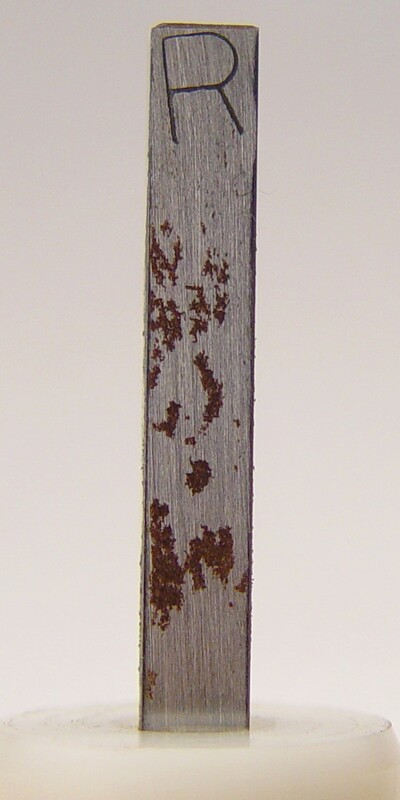 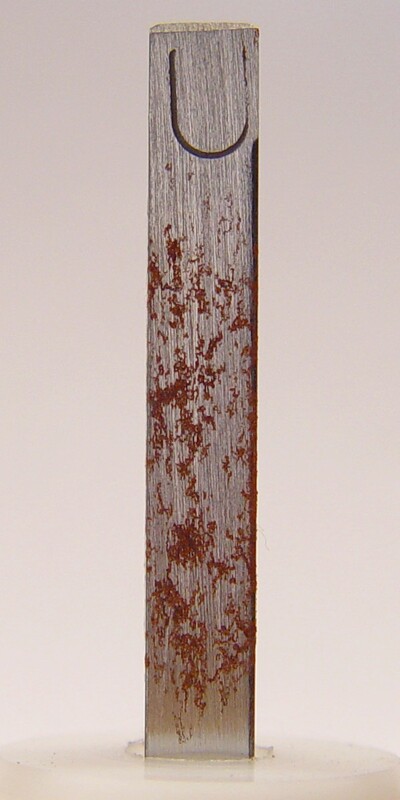 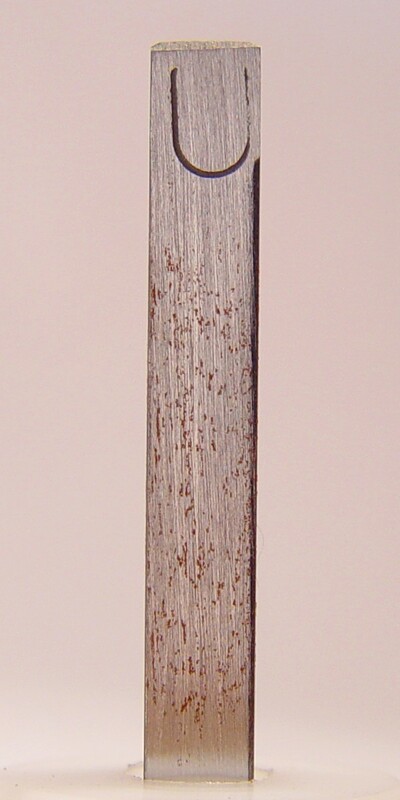 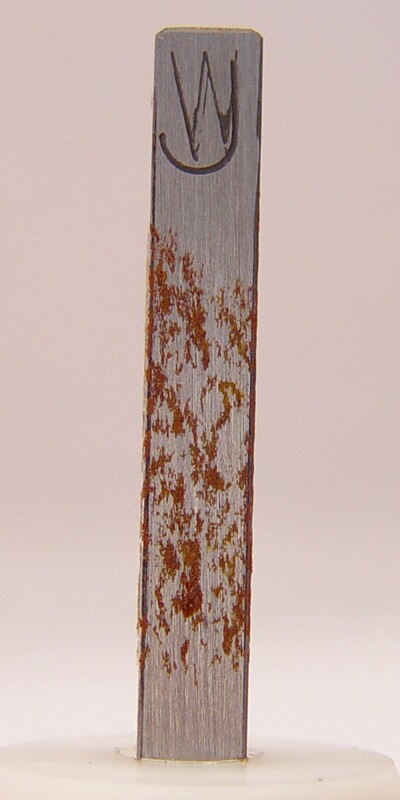 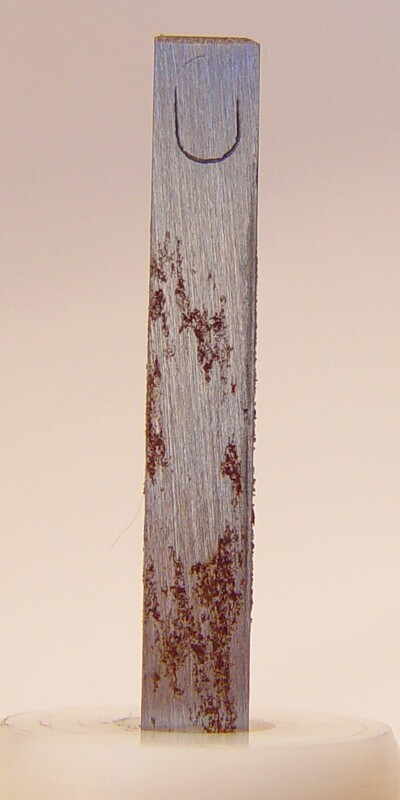 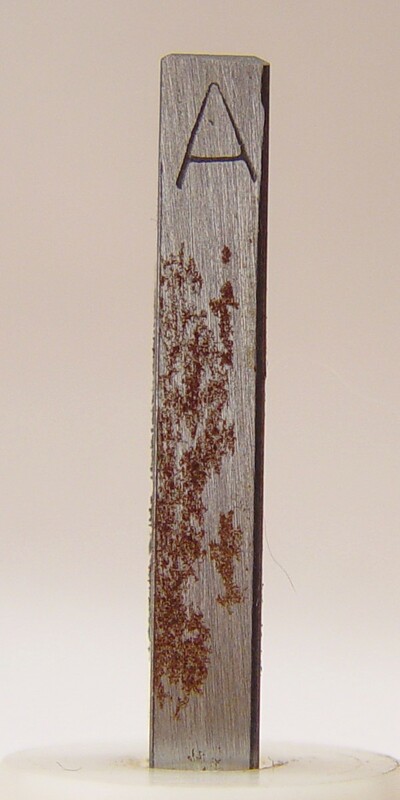 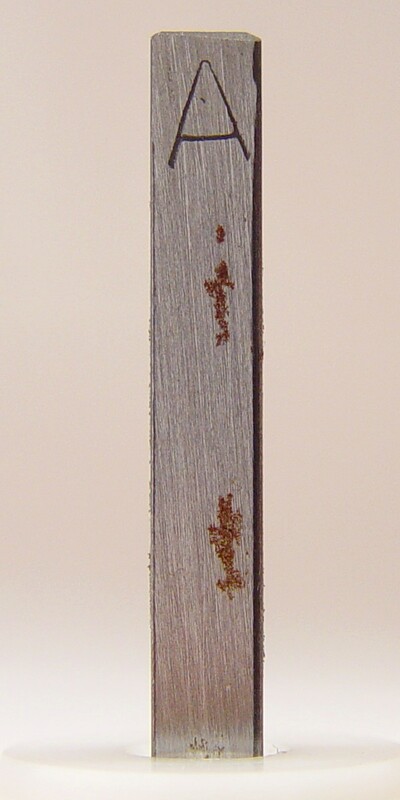 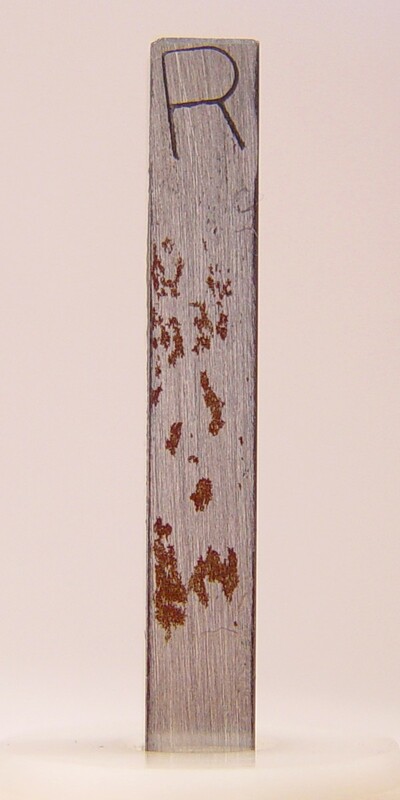 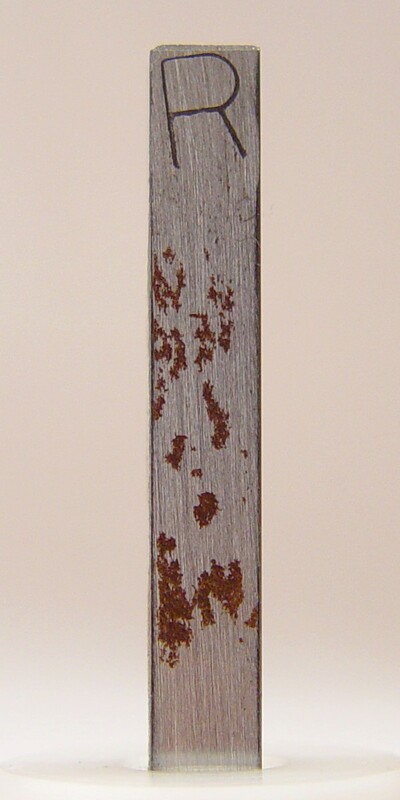 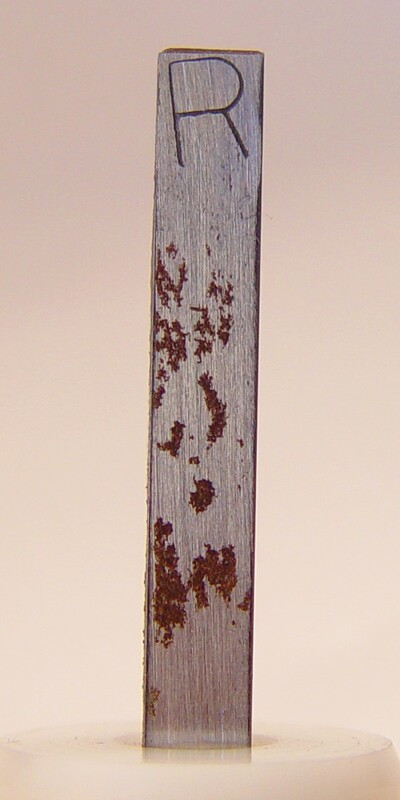 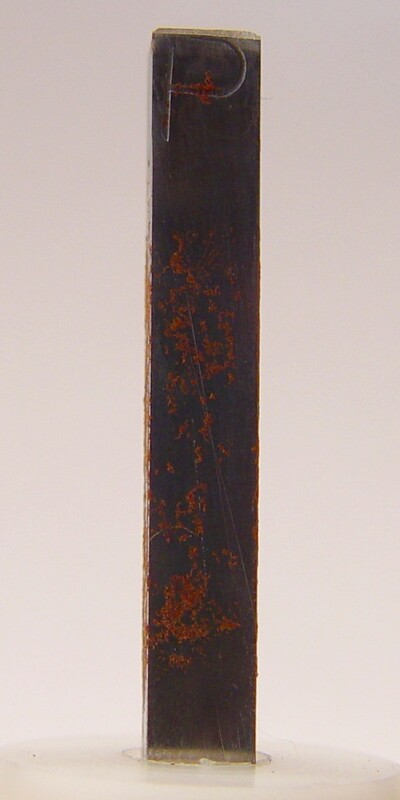 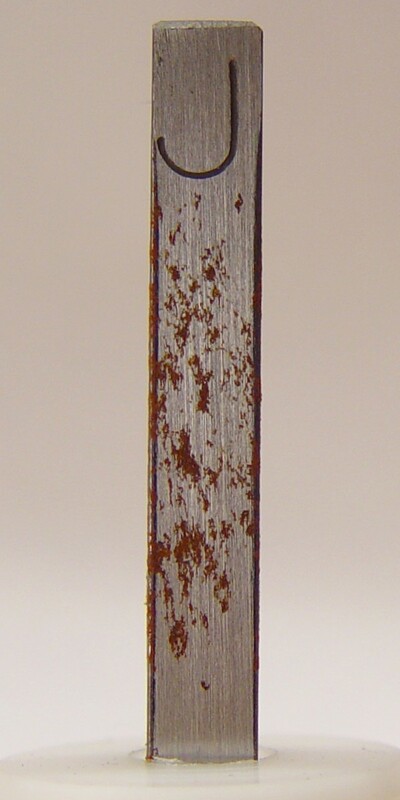 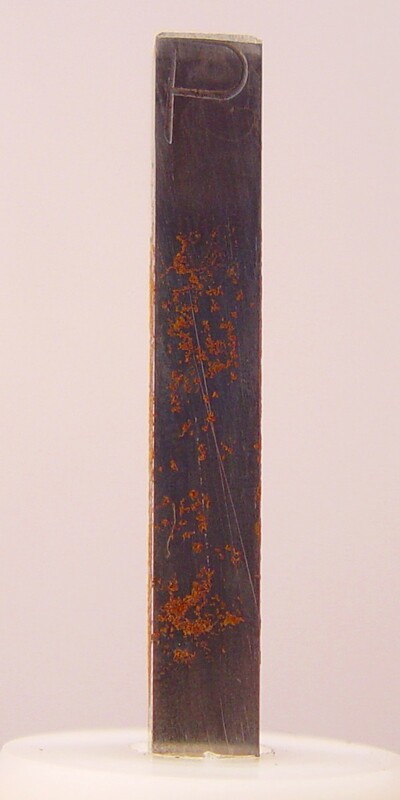 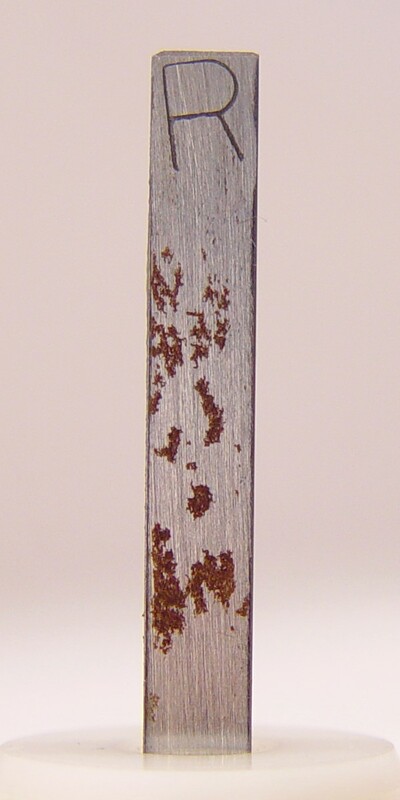 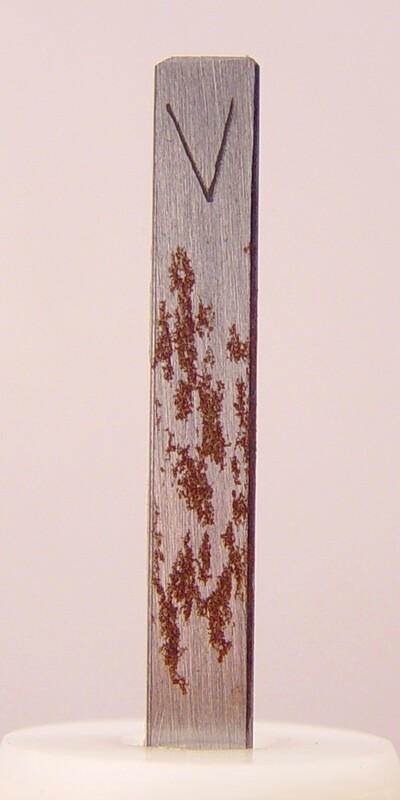 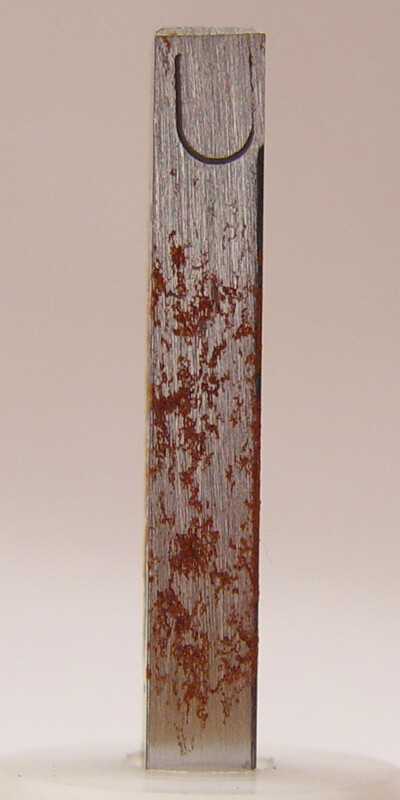 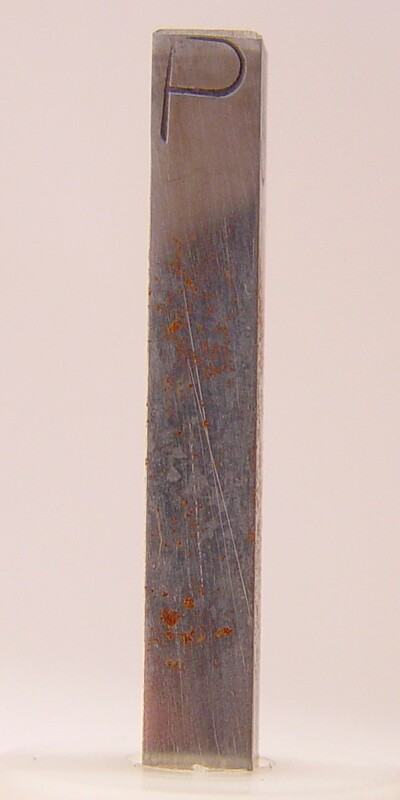 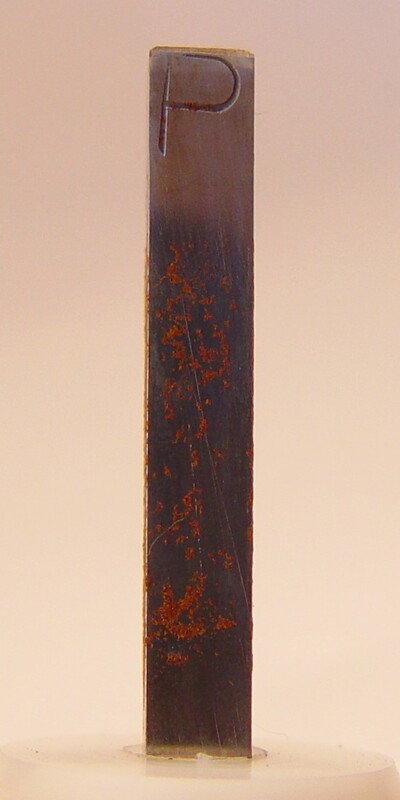 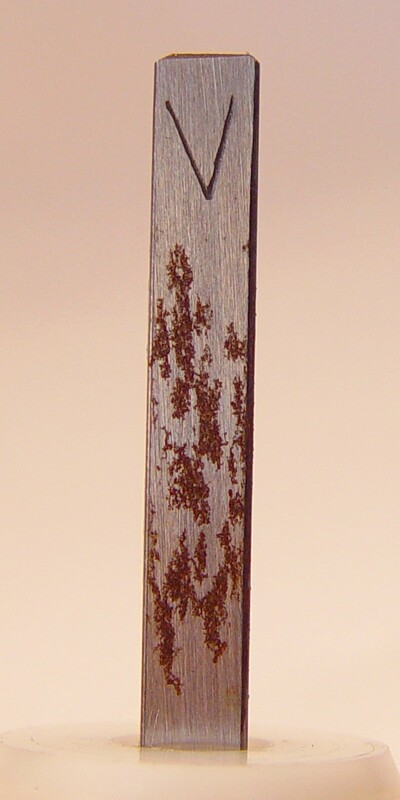 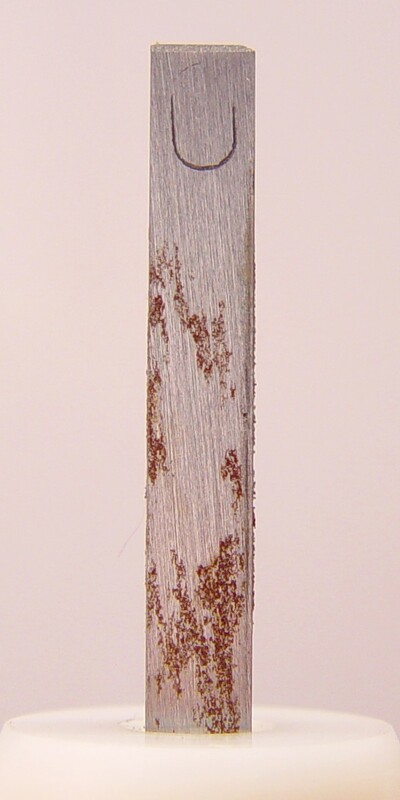 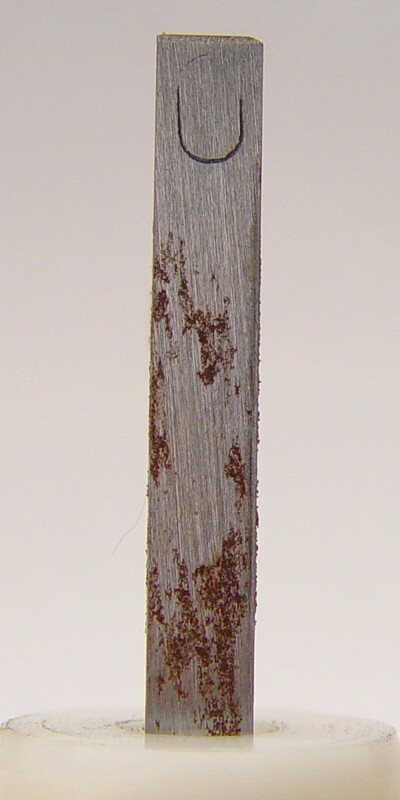 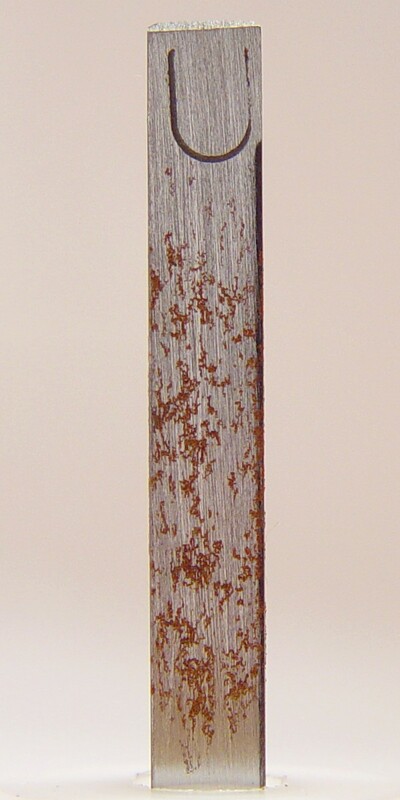 An earlier pilot experiment on these same steel bars was set up with a much lower concentration of powder residue (2 grains/5 ml), and although the relative performanceof each treatment was similar, rust was delayed on the treated surfaces for one to two weeks. 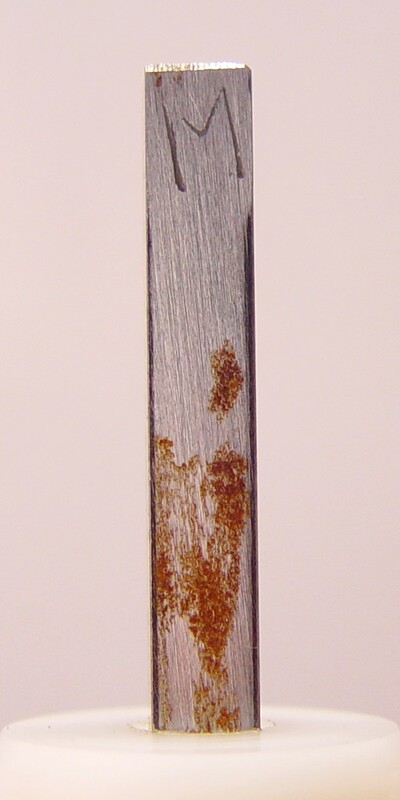 Using a higher concentration "accellerated" the corrosion on all samples, but it had a particularly bad effect on the MOS and vegetable oil based compounds, which failed almost immediately. 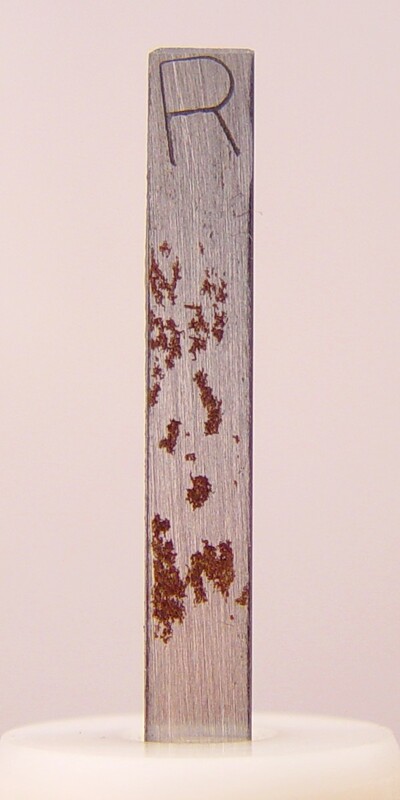 Note the very top section of the untreated surfaces ('U' and 'P'); although they had no protection at all, they also had no residue deposited in that location. 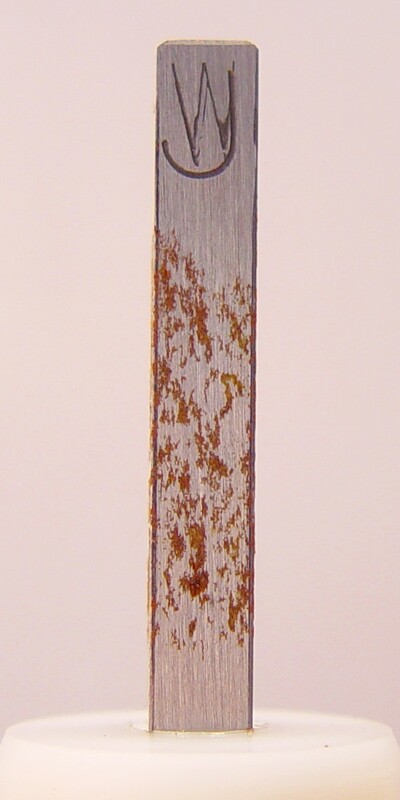 Clean, bare steel can remain rust-free for a long time if condensation of water on its surface is prevented. 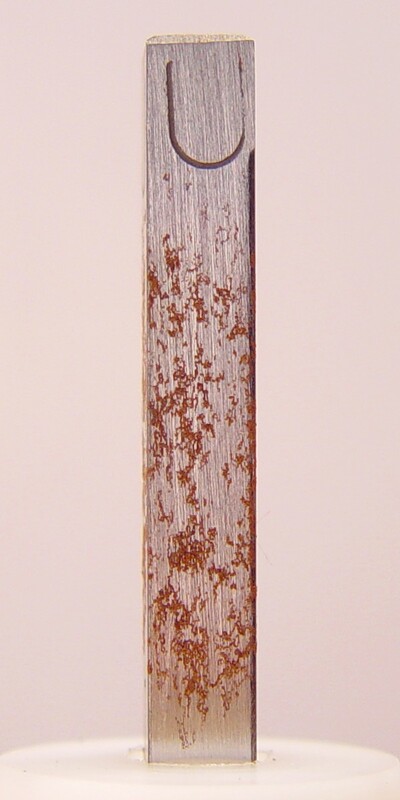 It is the presence of surface contaminants which initiates corrosion, and once it begins, the hygroscopic (water absorbing) properties of the rust accellerates the process. 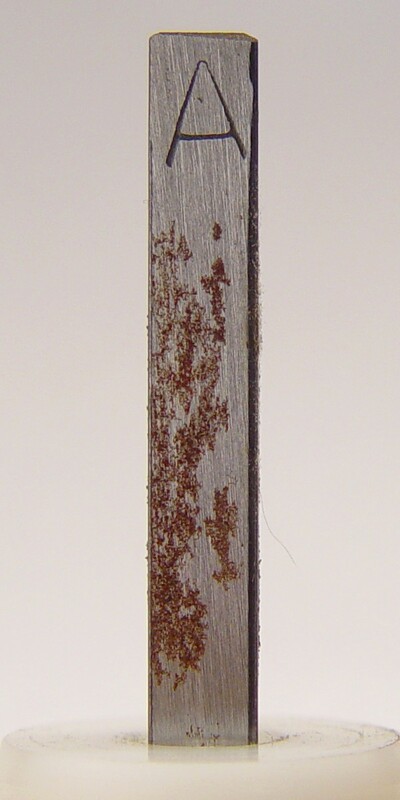 I think the main take-home message here is that good cleaning practices are the most important factor in keeping corrosion at bay. 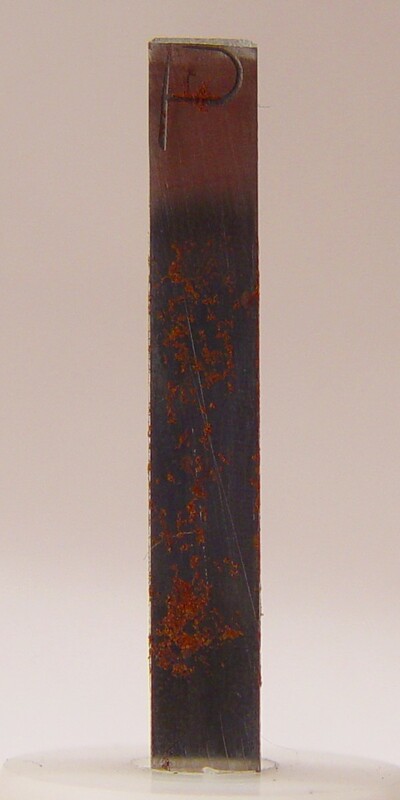 With black powder weapons, this means a thorough cleansing with water to remove all combustion salt residues. 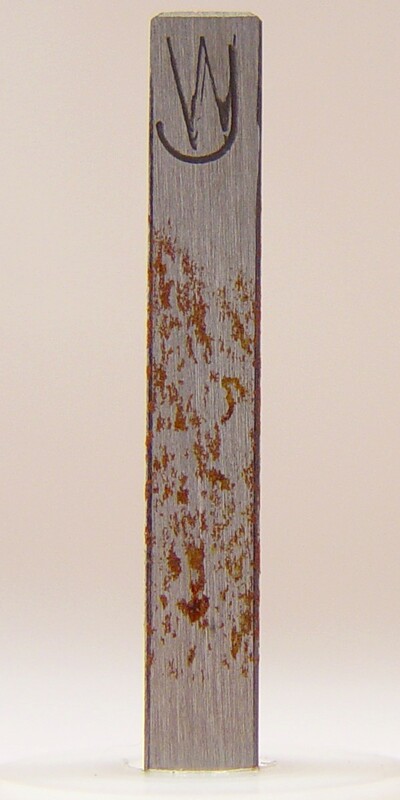 Then and only then can a good corrosion preventer do its stuff.